Quite a few of you raised an eyebrow when we topped our gift guide with the Canon HV20, an affordable (as little as us$700) HDV camcorder. Like the New England Patriots (that’s American football for the rest of the world), the Canon HV20 appears to be largely unbeaten as the best-available visualist-friendly camera. It’s small, it’s light, it’s cheap, it does HDV, ’nuff said. It’s also eminently upgrade-friendly, with indie producers adding 35mm lenses and nifty accessories. And even those of you with larger, more powerful cameras occasionally want something you can toss in a backpack or use as a backup. But that got me wondering — is the HV20 really One Camera to Rule Them All? I have a couple of candidates I think could be interesting. The big rival as far as HDV appears to be Sony. The HDR-HC7, for instance, has more sophisticated manual controls than the HV20, and I like Sony’s night-shot mode for extreme infrared applications. It’s also a little heftier than the Canon, in a good way — it’s a camera I find comfortable to hold. cnet even likes the Sony better than the HV20. (camcorderinfo.com begs to differ; see their link below) Like many things in life, it looks even cooler in Japanese. Unfortunately, "manual control" on a consumer-level Sony means navigating the horrible touch screen interface, and worse yet the HDR-HC7 introduces a bizarre new manual focus multi-function control. (Translation: some strange add-on bit of plastic that’s utterly useless for controlling anything.) All that said, I do like Sony’s cameras, despite their quirks. Here’s the problem: the HDR-HC7 is running a street of over $1100, while the HV20 is well below $800. Is the Sony $300 better than the Canon? (Heck, is the Sony better than the Canon, period?) Tough to justify, I think. Another reason I wish I’d been born in Japan: look, infants there are actually born with their own CCDs! The HV20 has some other advantages going for it, as well. Shooting quality looks great, and the Canon takes non-Canon accessories, whereas Sony is stuck with a proprietary accessory shoe. In fact, the general hackability of the Canon is a big part of its appeal. 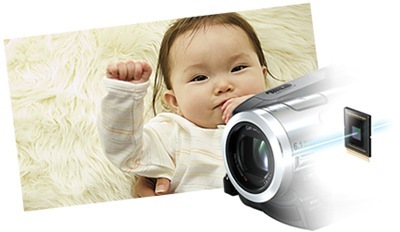 Search "HV20" and you’ll find all kinds of tips for squeezing more capabilities out of this popular camcorder. But the HV20, value-priced as it may be, can’t compete on features, manual controls, and low-light performance with even the compact consumer standard-definition cameras of the last generation. Too bad those models have all been axed so Sony and Canon could declare the "dawn of the HD era." Here’s an idea: MPEG4. 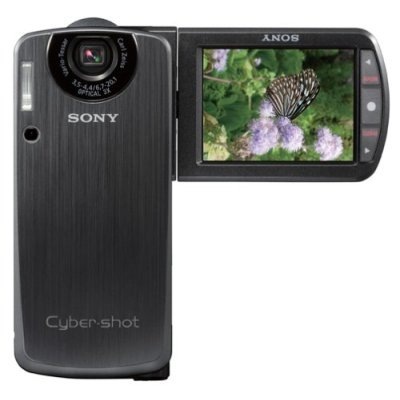 Cameras like the Sony Cybershot DSC-M1 (above) shoot natively in MPEG4. Shoot, then drop immediately into a VJ set — now that has some appeal. MPEG4 also works nicely for uploading to online services like our favorite, Vimeo. And then there’s standard def. Panasonic’s SDR-H200, for instance, has a street price even lower than the HV20 (under US$600), records to hard drive and SD card, has a 3-chip sensor, and most importantly, shoots well in the dark — the Achilles’ heel of all these tempting, affordable HD cams. No tapes means you can transfer straight through USB. The bad news: MPEG2 compression, which looks crap. My dream camera would feature really high-quality standard definition capture, basic manual controls and accessory options in a small form factor (no need for bulkier, higher-end models), but would use MPEG4 on a hard drive. Apparently, camera manufacturers don’t believe this is what we want. In fact, what I come back to is that the ideal rig would include an HV20 for HD footage on the go (or something bigger, like Jaymis’ preferred Sony HVR-V1P). Then add a used standard def camera for everything else — particularly low-light shooting, which is critical to visualists and interactive artists for documentation purposes. camcorder.info’s massive year-end review. In short, they like the HV20. So, uh, yeah, that kind of means the Canon wins, huh? New Low-Priced Euphonix Control Surfaces, Leaked Early?